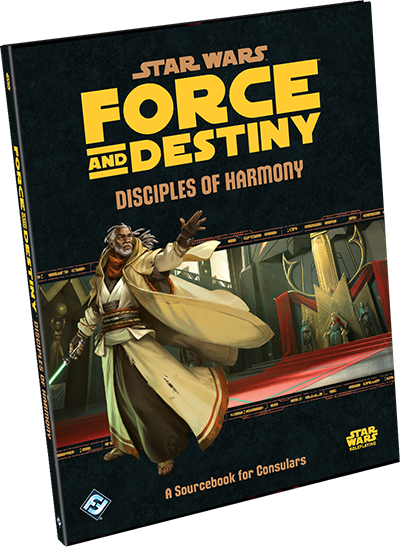 The fine folks at Fantasy Flight Games are at it again, this time with the Star Wars Force and Destiny sourcebook for the Consular: Disciples of Harmony. 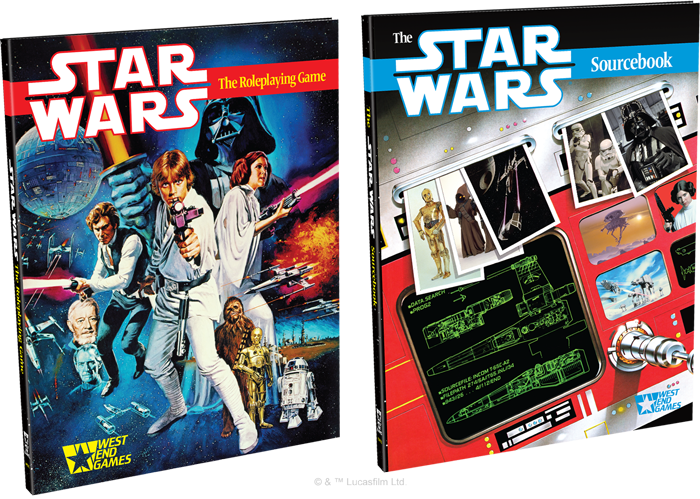 This book follows the now tried-and-true format of three sections: new species/specializations, new gear/vehicles, and a GM section about consular-focused encounters. 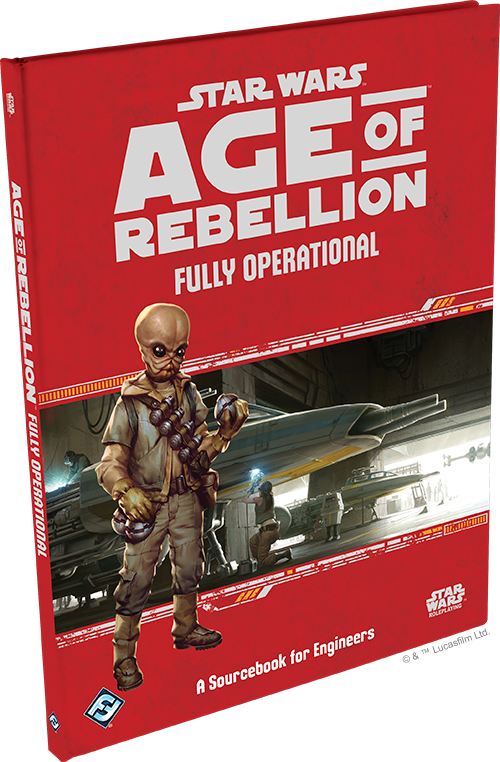 Out of Edge of the Empire, and Age Rebellion, Force & Destiny is the line I have actually played and run the least, but every line in FFG Star Wars has such great stuff it is worth picking up. This book is no exception. The first section has some interesting and to me, surprising choices for new species. 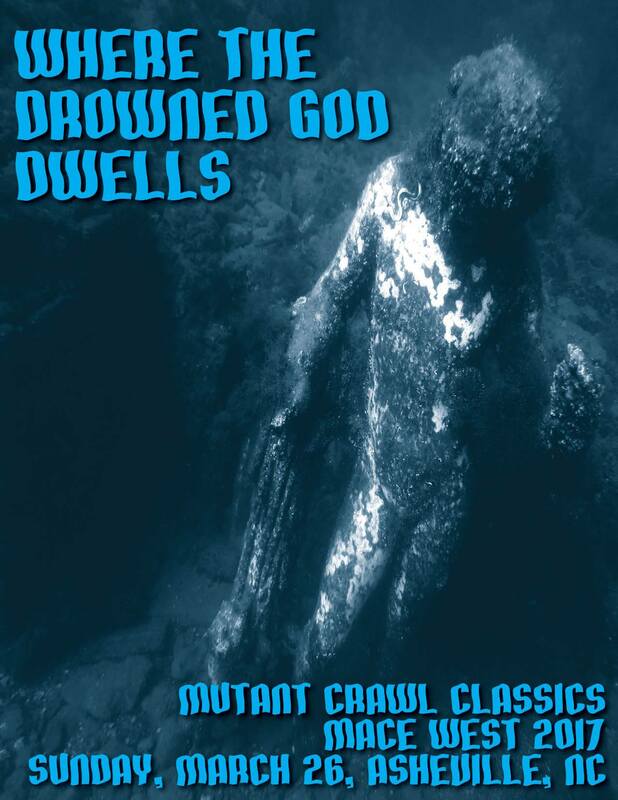 This book adds the Arkanian, Cosian, and the Pau’an. Arkanians are usually white-haired, white-eyed, 4-fingered near-humans that are known for superior genetic engineering and generally superior attitudes to other beings. Space Aryan would not be my first choice for a Jedi, but the book goes on to explain force-sensitive Arkanians seek a perfect understanding of the force through analytical research, allowing them to transcend they typical scientific perfection their people are known for and attain a more complete perfection though the force. They start with a 3 in Intellect and 1 in Presence. Beyond that, they have Dark Vision which removes two setback, and start with a rank in Medicine. I suppose this could work well for a conceited Healer, and could be a good choice if you are looking to role-play someone with a superiority complex. Alternatively you could go against type, and be the black sheep Arkanian who is actually nice. Cosians are a reptilian species that have kind of a beak, a tail that ends in a hairy tuft and blink up instead of down. 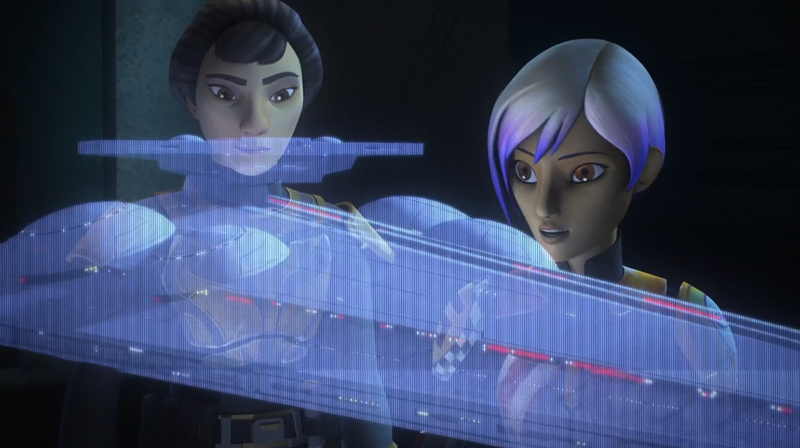 Some may recognize this race from Jedi Master Tera Sinube from Clone Wars. Out of the three, this choice seems to be the most natural for what I think of as the consular role. Hailing from a planet in the deep core, Cosia is a verdant planet and their villages are interconnected in massive trees on the surface. They start with a 3 in Intellect and a 1 in Brawn, as well as a free rank of Knowledge (Lore) and the racial trait Strong Backed, which gives them an Encumbrance of 10 + Brawn. 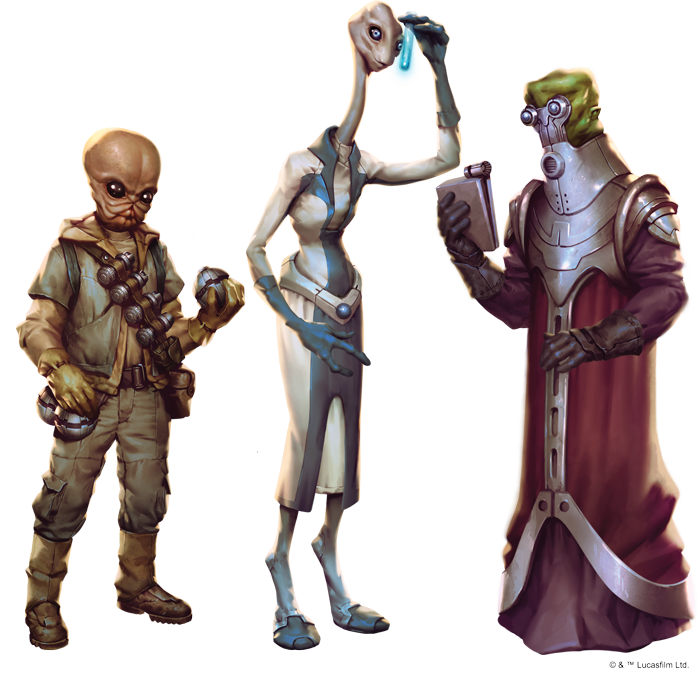 Pau’ans are the creepy race of (most notably) the Grand Inquisitor from Star Wars rebels. I had no idea what race he was, nor that all of them are that ghoulish in appearance. This makes them somewhat of an odd choice for one of the more diplomatic and “face” careers for Force and Destiny. 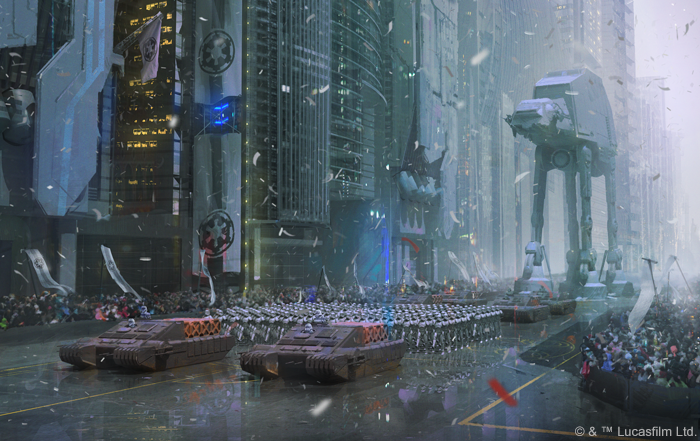 They originally hail from the planet Utapau, but the various clans have been driven from their home world by the Empire. They start with a 1 in Brawn and a 3 in Willpower, but interestingly start with +12 wound threshold and +8 strain, which makes them a bit more balanced than at first glance. They start with a rank in Negotiation or Coercion, and have sensitive hearing which gives them a boost die on Perception and Vigilance checks as long as they have their protective earpieces. With those removed, they suffer an automatic threat as their ears are overwhelmed. This would certainly make an intimidating character or NPC, but seeing them in a diplomatic role is still a hard sell for me. Still, I’m glad to have the option for other careers/specs. The new specializations compliment the core consular specs of Healer, Niman Disciple, and Sage quite nicely. The new specs are Arbiter, Ascetic, and Teacher. The challenge with the core consular specs is the career seems to focus on 3 characteristics: Intellect, Willpower, and Presence. While choosing one of the specs will allow you to narrow down to two main characteristics, if you are cross-specing within consular, you’ll want at least a 3 in each. 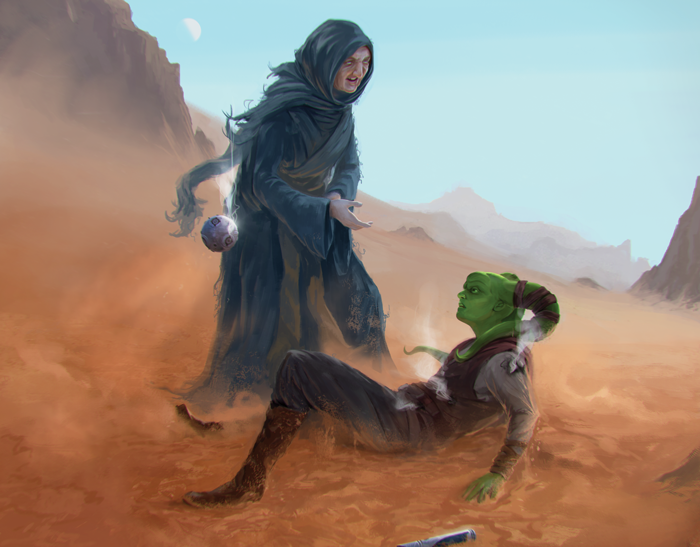 Arbiter is the classic role of Jedi as mediator or judge to resolve disputes. To the base consular skills of Cool, Discipline, Knowledge (Education), Knowledge (Lore), Leadership, and Negotiation, Arbiter adds Knowledge (Xenology), Lightsaber, another Negotiation, and Perception. The skill tree is a nice balance of defensive combat talents like parry and reflect, as well as “face” talents like nobody’s fool and a new one called savvy negotiator. My favorite new power on the bottom row of the tree is Aggressive Negotiations. 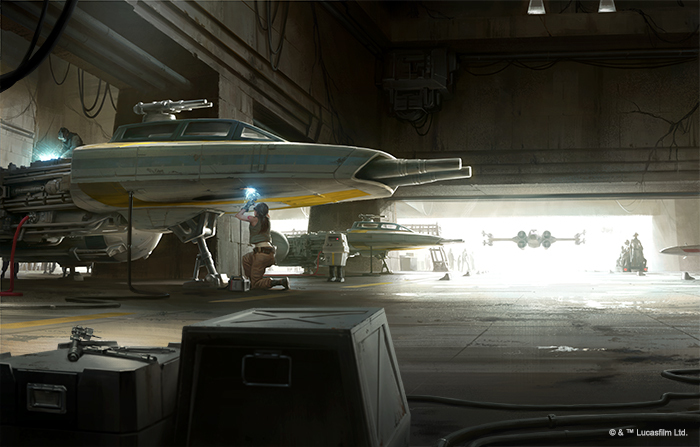 Once per session you can perform a hard lightsaber check to reduce the difficulty of all Negotiation checks for the encounter by 2. Not downgrades… difficulty. That is one impressive lightsaber show! Ascetics are essentially monks that eschew possessions and have studied the force in hermit-like isolation. To the core skills they add Athletics, Discipline, Resilience and Vigilance. Clearly this build relies more on Brawn than the others. Surprisingly, the only talent with an inherent conflict cost is in this tree: Mind Bleed. This allows a character to reflect physical damage on an attacker by suffering an equal amount of strain. It also requires the PC to have 2 or less encumbrance. The character suffers a number of strain equal to the wounds suffered from the attack. The attacker then suffers wounds equal to the strain suffered. Pretty dark stuff. The tree is also loaded with grit, so between being a brawny and gritty tree, its kind of dark being an Ascetic too. The Teacher adds another rank of Knowledge (Education), Knowledge (Lore), Leadership and Perception. This would be an interesting choice to take as a first spec, as an inexperienced PC will have much to learn. Mechanically it is pretty nice since Well Rounded is a 5xp buy on the tree which allows you to choose two additional skills of your choice to make career skills. It also allows you to lend your expertise through talents like Skilled Teacher which allows you to suffer strain equal to ranks in Skilled Teacher and provide an equal number of successes to the ally’s next check. This has some very cool role-play opportunities. Teacher is probably my favorite out of the new three. Lots of interesting talents deep in the tree as well. 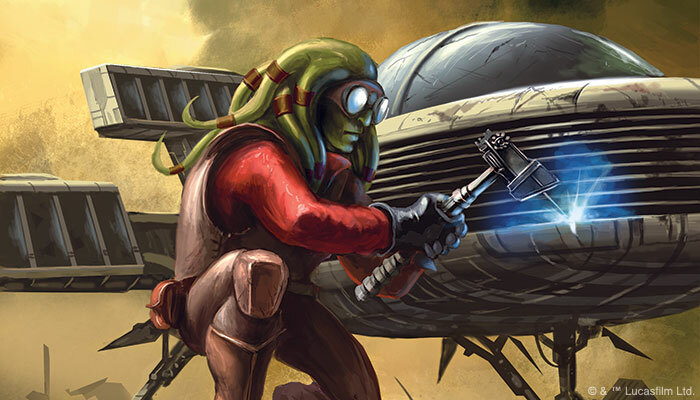 The weapons/gear/vehicles sections of Force and Destiny books are rarely the highlight, but this has a few really cool additions, including a lot of non-lethal options which can be fun for bounty hunters or those trying to not gain the conflict associated with murdering people. The concussive rifle is like a noise blunderbuss, and there are a few nice new grenades in the Spore Stun grenade, and the Spray Foam grenade. But the really cool addition is the melee Z6 Riot Control Baton, famously from the scene in Force Awakens with Finn and the lightning-baton wielding First Order trooper. This will be fun to arm potential foes of the PCs as it has the Cortosis quality, Disorient 2 and of course, Stun Damage. Armor includes a diving suit for aquatic diplomatic missions, as well as in interesting Reflect Body Glove that provides very low-profile armor, but degrades with each hit. It may be repaired with an average Mechanics check. 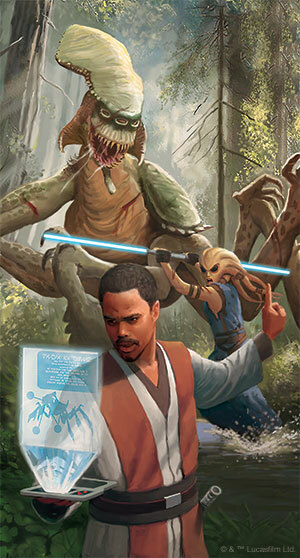 The book adds some interesting lightsaber crystals in the Cracked Crystal which according to the text is from the debris of the first Death Star’s destruction in Yavin and a Corrupted Crystal, which is essentially a dark side crystal you can “reclaim” once your PC’s morality rises above 70. Seems like some cool role-playing options there. The vehicles are predominantly very low crew/passenger capacity. This would be cool for games with one or two PCs, but would seem to have limited usefulness in larger groups. The capital ship section is pretty cool, with stats for the iconic Consular-class cruiser first seen in the Phantom Menace. 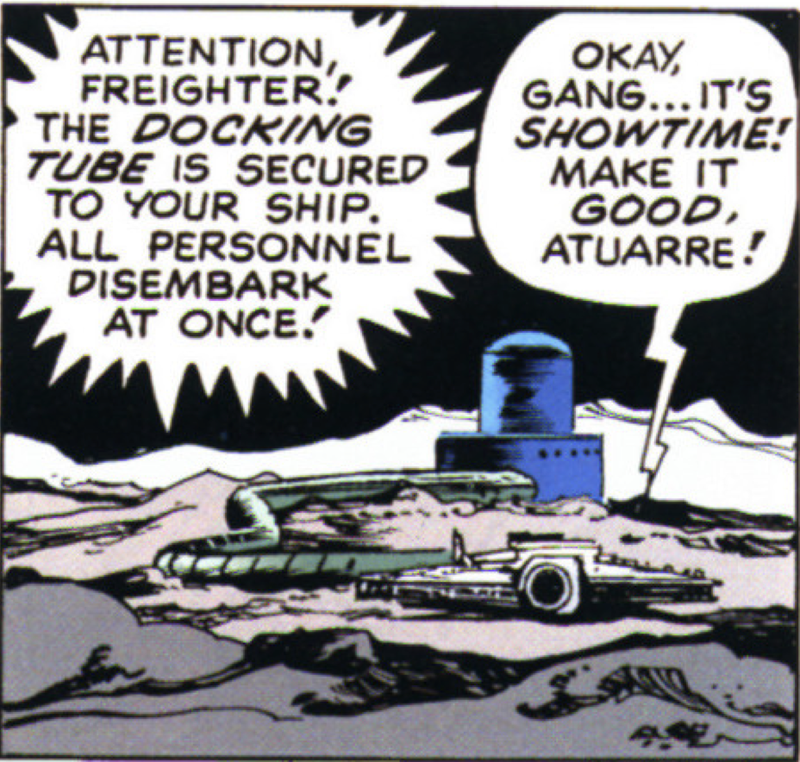 Its got a cool sealed conference room pod that servers as an escape pod in a pinch. 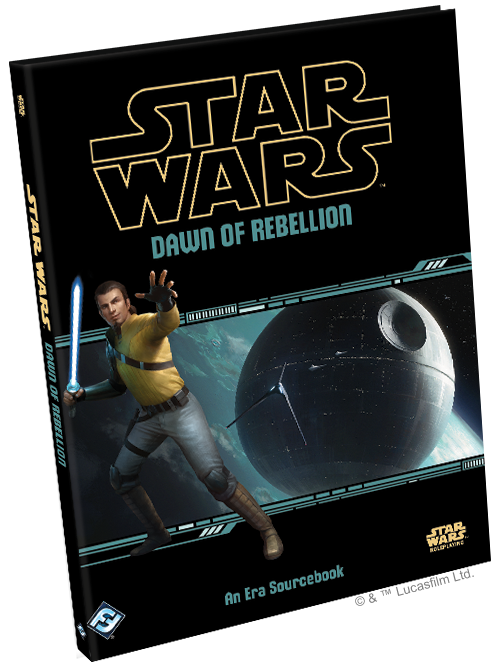 This book also details stats for the Jedi training cruiser Crucible – which would be an awesome adventure in itself! 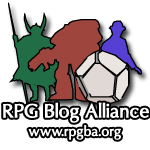 The GM section discusses incorporating three types of mentor NPCs to the campaign, each with different styles and examples from the movies and shows. There are some helpful tables that suggest styles and complications to bring your NPCs to life. They also include example stat blocks of each type: Trainer, Consultant, and Challenger. 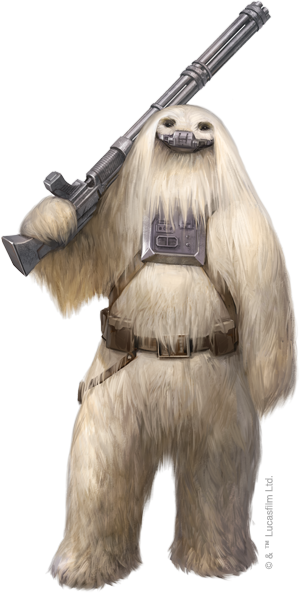 Most interesting to me was some details on alternative force traditons: Baran Do Sages, Dagoyan Masters, Gand Findsmen, and Sith Lords. Provided are benefits and drawbacks to studying with each group, as well as an XP cost to eventually overcome the drawback. The benefits include reduced XP costs to learn certain powers that correspond with the different groups. I hope they have similar stats for the Nightsisters adventure that is coming out soon! One really nice section discusses knowledge checks. 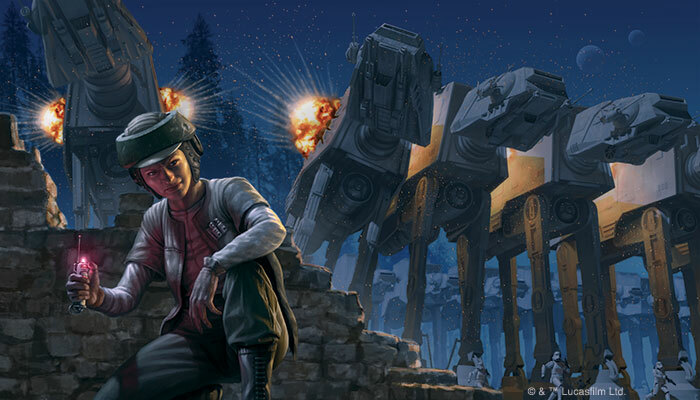 It provides two possible approaches to encourage knowledge checks and make them more dynamic, and is illustrated by my favorite illustration in the book: a human consulting a datapad while his Nautolan friend holds off a Stalking Acklay. The final section talks about making diplomatic encounters exciting and provides a table of possible success/failure/advantage/threat/triumph/despair results. I’m still not convinced any amount of political maneuvering will be more fun than a firefight, but at least it gives you more tools to help spice them up a bit. Overall, this book surprised me with how much great stuff they packed into 96-pages. I would highly recommend this book for those looking to diversify their encounters and include some really intriguing options beyond force-sensitive PCs. Despite the entire shelf I now have dedicated to this system, quality has not gone down. Time to clear another shelf!